Suitable for domestic and light industrial use. This pump is supplied as a complete kit with 50 meters of cable and pipe and can be fitted in very little time. It also has the following as standard. Constant pressure variable speed pump. High efficiency pump and motor. 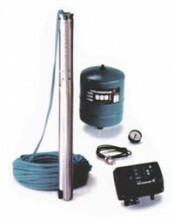 Click the button below to add the Grundfos DIY submersible constant pressure pump 50m to your wish list.